You can now put your Cryptosporidium outbreaks and carcinogenic chloramines fears to rest and spend less in the process. Emperor Aquatics Inc.'s SafeGUARD UV Systems are more energy-efficient and have a drastically lower cost of ownership than competing UV sterilizers in the aquatics industry. Emperor Aquatics Inc. has been a leading U.S. innovator for more than 20 years, and has achieved NSF/ANSI's highest UV Disinfection rating (7 log). SafeGUARD UV systems are available in both SCH-80 PVC and 316L stainless steel, and can offer an annual free-chlorine savings of 25 percent to 30 percent. The new Millennium Trellis joins the current trellis series from Poligon®, which includes flat/gabled trellises as well as curved and pitched trellises. 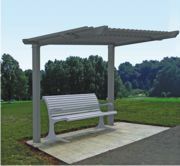 The Millennium Trellis combines a comprehensive design package of customizable frame heights and lengths with a Poli-5000 powder-coated steel frame to provide the best trellis shelters available for parks, public gardens, athletic complexes, amusement/waterparks, commercial and residential developments, health/educational facilities and more. The company is now offering integrated benches, plant-climbing panels, three styles of truss end options, windscreens and custom columns. SofTILE is an exceptionally durable playground surfacing system that locks in place, is vandal-resistant and class A fire-rated. SofTILE offers fall protection ratings that exceed national standards by up to 50 percent, making SofTILE the No. 1 rated product for fall protection. SofTILE carries a 10-year warranty, including guaranteed compliance with fall protection standards. SofSurfaces' new DuraSAFE series, available in spring 2011, is the only playground safety surfacing system that is safety rated to the tops of playground equipment railings at no additional cost to the owner. Porter recently introduced a new 25-year warranty on its basketball backstops. The warranty protects consumers against defects in material or factory workmanship on Porter "900" series ceiling suspended structures. The warranty applies to the original purchaser and is limited to the backstop structure only, defined as: backstop, framework, attachment superstructure, clamps, hangers and braces. The new EZ Launch® for Kayaks and Canoes is the first and only port system built specifically for paddlers. It's simple and safe to use so that everyone will find boarding, launching and recovery a breeze—EZ Dock's oversized rollers and guide rails make it easy to glide on and off. It can even be made universally accessible with the addition of the new Accessible Transfer System, which allows individuals with disabilities to slide over and drop down into their kayak or canoe. Empex debuted a water playground in the state-of-the-art Beijing Happy Magic Watercube Indoor Waterpark. The Empex water playground caters to children up to age 12 and complements the larger slides and structures in the facility. The area has a central Aquadek climb and slide feature with a variety of smaller slides and events, creating a dynamic "Aquatecture" in the area. Surrounded by Aquatons spray features and ground jets, the area becomes an exciting spraypark for the younger set. All products are fabricated from non-ferrous composite and specialty plastics offering lifetime corrosion warranty. Pebble-Flex® is an ideal choice for soft safety surfacing. The light-stable system combines thermoplastic pebbles with aliphatic urethane binders. The product is a troweled down elastomeric application unaffected by freeze-thaw cycles. Pebble-Flex® is ideal for water play, pool decks and playgrounds, with a five-year warranty. The original Chrono 600 is the most rugged unit for the total commercial cleaning experience. This robust cleaner chassis is completely made of stainless steel and is all about strength and durability. With its variety of easy set cleaning patterns, the Chrono 600 can perform and clean the pool at a fast speed. It is equipped with heavy-duty drive belts and an easy-to-remove filter cover conveniently located at the top of the cleaner for easy access to the reusable filter bag.